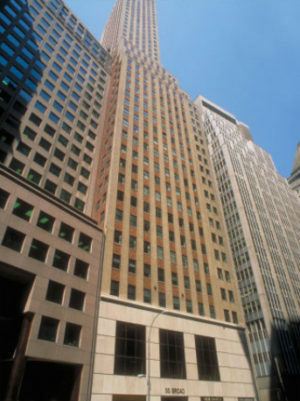 Virtual Office New York is situated in the financial district of down town New York right next to the stock exchange. The prestigious building and the luxurious decorated reception area invites you to our modern, technology advanced, executive office suites and conference facilities, and are guaranteed to impress your clients. Located right at the tip where Hudson and East River meets, the locations is just minutes away from the Congress Center and reached the fastest over Interstate Road 278 and the FDR Drive. The only 30 minutes driving time to La Guardia International Airport makes this location a close choice for frequent business travelers. Whether you are in need of physical executive office space or just need a remote location for your business, the Virtual Office New York has a suitable plan for you. All office suites are fully furnished and technology ready, the complete turnkey solution for the flexibility demanding business executive. The setup process is easily done online, add the location to your card, pick from additional services like eFax or automated receptionist services, establish your account and we will have your business up and running in less than 24 hours. To make an inquiry for the more frequent usage of executive office space or to visit the location beforehand, kindly call 1.866.793.7969 or click the button below the description area, we will be happy to arrange a tour for you.